A good blend of flavors. I liked how the vinegar cut some of the sweetness of the BBQ sauce. A couple of drops of liquid smoke added a nice smokey flavor. I've been doing this kind of bbq for a while and when the pork is done I throw in about 4 chicken breasts and slow cook in the same juice. After all is cooked it freezes well also. It was so easy and delicious! Took exactly 8 hours. 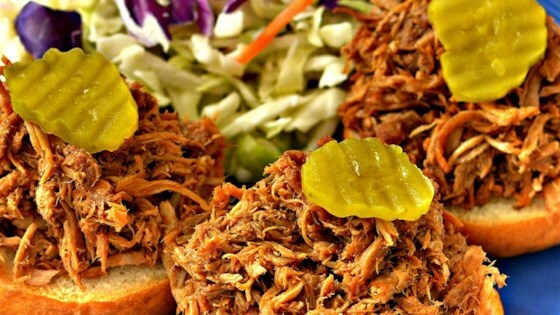 I have made this and other variations of Pulled Pork in the crockpot many times over the years. This is not Barbeque. It is not smoked with coals. It is good, though.